Because we understand that anything good takes time and commitment. FINE PORK can only make its way to your table after the utmost care and devotion to the well-being of the animal. The animals live a stress-free life with plenty of open space to roam and exercise. This freedom promotes exquisite intramuscular marbling you can’t achieve any other way. We also understand that the choice of diet influences the taste of what ends up on your plate; that is why they’re fed an all-natural 100% vegetarian diet. Dedication to all these aspects is why TENDER BELLY PORK PRODUCTS are the finest and most mouthwatering on the market. THE MOST HONORED LEGACY OF A GLORIOUS TENDER BELLY PIG IS TRULY GREAT BACON. We founded our business on our obsession with making great bacon and a passion for heritage pigs. And the most honored legacy of a glorious Tender Belly pig is truly great bacon! The heritage pigs we use for our bacon are from Iowa and are naturally grown: NO antibiotics, NO hormones, NO gestation or farrowing crates, and fed a 100% vegetarian diet. With their exceptional meat to fat ratio they are the perfect belly. Our signature maple and spice rub is applied, the bellies are dry cured and then cherrywood-smoked to perfection. We spare no expense with ingredients, process or time to give you the best possible product. Remember: BACON, it’s good for ya! GIVE IN TO YOUR SWEET TOOTH WITH OUR VERY OWN DRY-RUB UNCURED MAPLE BACON! Same great flavor and everything you’re used to with our Signature Maple Bacon, except NO nitrates! We founded our business on our obsession with making great bacon and a passion for heritage pigs. And the most honored legacy of a glorious Tender Belly pig is truly great bacon! The heritage pigs we use for our bacon are from Iowa and are naturally grown: NO antibiotics, NO hormones, NO gestation and NO nitrates or farrowing crates, and fed a 100% vegetarian diet. With their exceptional meat to fat ratio they are the perfect belly. Our signature maple and spice rub is applied, the bellies are dry cured and then cherrywood-smoked to perfection. We spare no expense with ingredients, process or time to give you the best possible product. Remember: BACON, it’s good for ya! 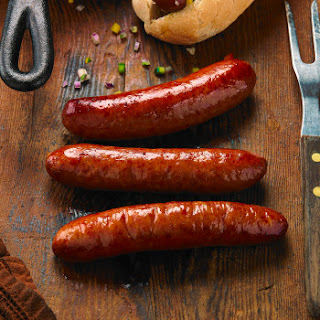 SMOKED AND SUBTLY SWEET, OUR FRANKS SIMPLY CAN'T BE BEAT. A lot of our fans like to call them hot dogs but that wouldn’t be fair to other hot dog makers. We call them franks because of the extra effort we put into them. They are uncured and 100% Berkshire pork from the hind leg, coarse-ground like wonderful Old World sausage. They’re applewood-smoked and have a subtly sweet and delightfully salty taste. The snap our frank makes when you bite into it is exactly what you would expect…perfection. Tender Belly Pork Products are delicious! 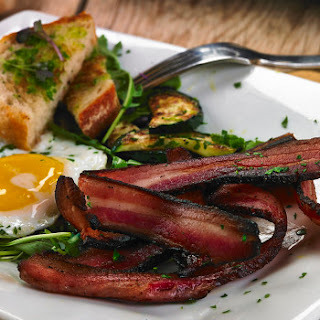 Tender Belly's Maple Cured and Dry Rub Uncured Maple Bacon is full of flavor. Tender Belly Bacon is extremely tender and seemed to melt in my mouth. Tender Belly Bacon is definitely not like your average bacon sold in most stores. Tender Belly Franks are incredibly tasty and perfect for your backyard barbecues. I was completely amazed at the flavor in their franks. My taste buds kind of had a little mini party when I took my first bite. I mean these franks are so good! The care that goes into producing Tender Belly's Pork Products comes through with that very first bite. I highly recommend you all try their products. You won't be disappointed! 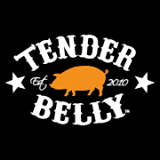 Click HERE to find a store near you that sells Tender Belly! YOU'RE NOT A REAL BACON LOVER UNLESS YOU'RE A MEMBER OF THE BACON EVERY MONTH CLUB! Click HERE to learn more about Tender Belly! Follow Tender Belly on social media!